Cassiopeia. This constellation is named after the vain queen Cassiopeia in Greek mythology. The five stars in the constellation Cassiopeia appear in the celestial sphere in the shape of the letter W and can be observed in the northern hemisphere and down to 20oS. Perseus. This constellation is named after the Greek mythological hero Perseus. 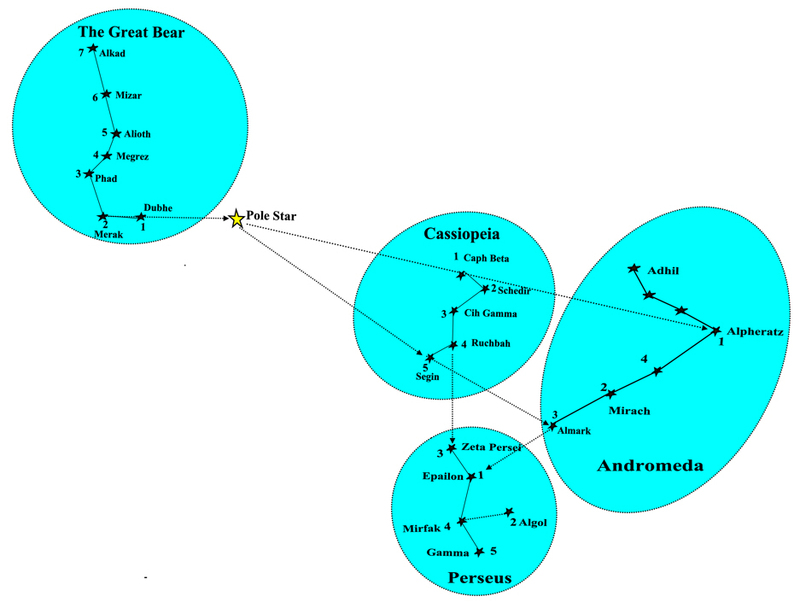 If a line is drawn from star 3 to star 4 of Cassiopeia, it will point almost directly towards star 3 of the constellation Perseus at about one hand-span as shown in the diagram. Andromeda. The diagram shows that, if the line from the Pole Star to star 5 of Cassiopeia is extended, it will point to star 3 of Andromeda at about one and a half hand-spans and that a line from the Pole Star through star 1 of Cassiopeia will point to star 1 of Andromeda. The diagram also shows that the 4 primary stars of the constellation Andromeda, when lined up, point to star 1 of Perseus.